25-Sep-2006 -- This is the 14th confluence visit on a bicycle trip from China to Central Asia. The story starts from 32°N 107°E. After an unsuccessful visit of 46°N 81°E two days earlier, we decided to go for this confluence which is 30 km beeline from the village Kölbay. When we reached Kölbay in the late afternoon, we tried to reach the confluence by hitchhiking. The confluence is 35 km off from the main road so we didn’t see a reason to cycle 70km back and forth. Another reason not to use the bicycle was that it was already afternoon – we wouldn’t make it before dusk by bike. So we parked our bikes in the village Qizilqaying and tried to stop a car that could take us. But it turned out that there wasn’t anyone going that far into the steppe where the confluence is located. After standing one hour at the road side, we gave up and spent the night in a “café” in Kölbay. We met some young Kazakhs with a car, who offered us a ride to the confluence for the next day. One of the guys seemed to be very curious in confluence hunting and said he would take us for 500 Tenge (3$) the next day. We were happy about that offer. But when they came again, they said that the price was 500$, not 500 Tenge. This “little” change increased the price by a factor 150. The new offer made us modify our plans by cycling to the confluence. At 6 o’clock we got up and left at 7:20 after having a breakfast of Lagman (a bowl of hand made noodles). We rode towards north-west on a sealed road with many pod wholes. When 4 km from our goal, we turned off from the road and followed a track to a single standing house (3.4 km). We passed the house and reached a lake (2km). We left our bikes behind (1.7 km) and hiked to the confluence. For half an hour, we had a picnic at the confluence, sitting at one of these sand-dunes and watching the huge Kazakh steppe. We observed “rolling grass” driven by the wind, spinning around, coming and going. 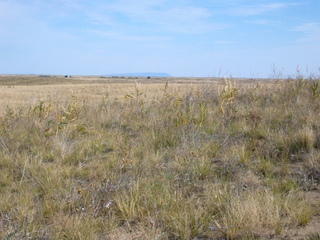 Besides the grass, there were some dry bushes, birds, cow pats, and some snow covered mountains far at the southern horizon. The way back was not spectacular – we passed the same features in reverse order. At 1:30 pm we were back in Kölbay – a lot effort for a confluence visit – which had been incomplete for three years due to the absence of pictures. Why have the pictures come with a delay of 3 years? Our memory flash card of the camera broke while touring in Kyrgyzstan. Several attempts to recover the data failed, until I tried one more time and succeeded. Time at the CP: 10:30 a.m.
Vegetation: dry bushes, grass in the dips, some interesting “rolling-grass” that spins driven by the wind and reaches far places to spread the seeds.